Landscape design employs four principles: form, texture, color, and line. More recently, density and mass have been added to the list as designers defined what gave smaller landscapes the same feel and interest of the larger, more spacious designs of the last century. The modern implementation of these six principles is often achieved using structure or "landscape bones" - called "hardscape." This hardscape not only develops these landscape principles, it enhances the visual scene by creating contrast while providing continuity within the garden as it is viewed from different settings. In short, it solidifies the garden's central theme. Hardscape can take any manner of structure - from boulders, to statuary, to lanterns, to birdbaths, to any number of available man-made or natural creations. I have seen old porcelain bathtubs, rusty bed frames, and even old shoes used to provide hardscape. It also serves as a functional support to display our various landscape plantings (our "softscape"). 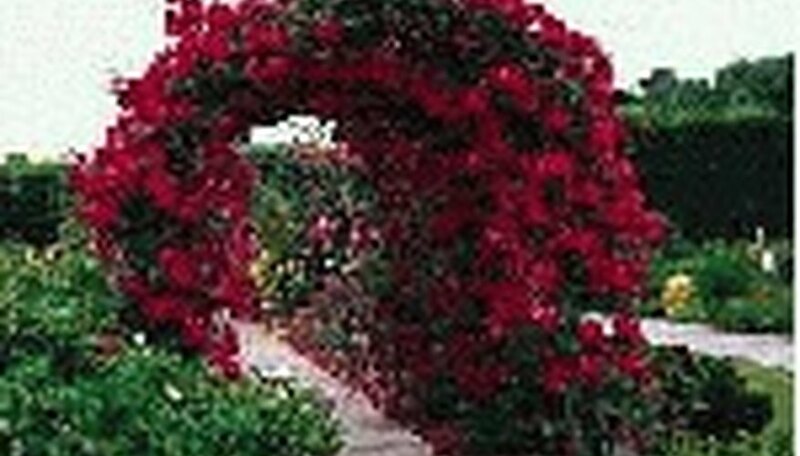 It is particularly useful when training and displaying climbing roses. Unlike vines, which can attach themselves to most anything, climbing roses need a support to train and display them. 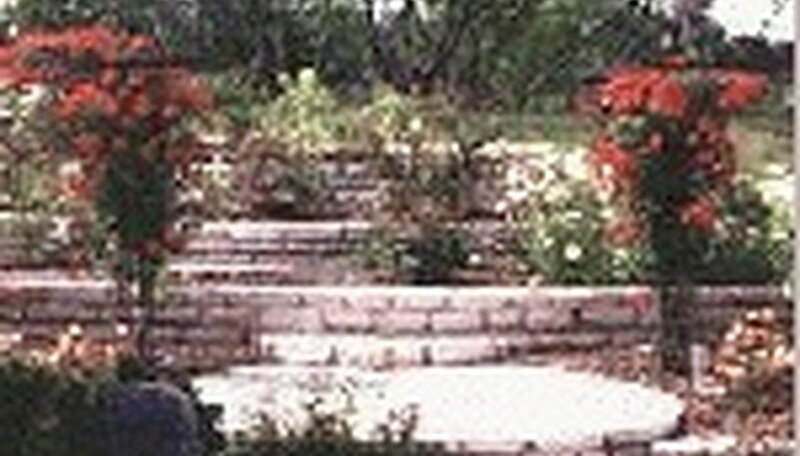 For roses, this type of hardscape comes in three basic landscape forms: 1) vertical - pillars and their cousins, the teepees and parasols; 2) horizontal - trellises and their relatives, the screens, fences and walls; and 3) a combination of vertical and horizontal - arches and their kin, the arbors, pergolas and swags. 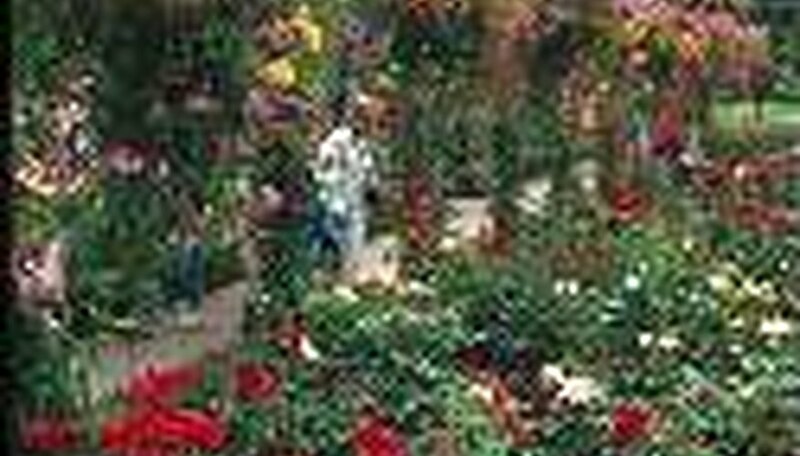 The use of pillars or columns to support roses (called "pillaring") can be traced back to centuries long past. A pillar is a central post around which the rose's canes are loosely coiled. By coiling the canes, they are made more horizontal than if trained vertically by running up the sides of the column. This technique creates more bud breaks, more new growth, and hence more blooms. A perspective of Rose pillars is a charming feature in a garden, and one of the ways in which their beauty may be best enjoyed. They should be so placed that one can go right up to them and see the Roses at eye level and below it and also against the sky, and smell their sweet scent in perfect comfort as they grow. ... the Roses are trained either up or round it outside, or up a central support and then out at the top, from whence they fall over and cover the sides. ...the Rose umbrella, a way of training a free-growing standard that, though its evident elaboration of support does not commend it to people of simple taste, yet certainly does produce a wonderful show of bloom. The parasol is essentially a wrought iron pillar with what is best described as an umbrella frame attached to the top. The rose is pillared around the central "trunk" then threaded and draped over the top, thus allowing the rose to cascade out of the top of the structure. 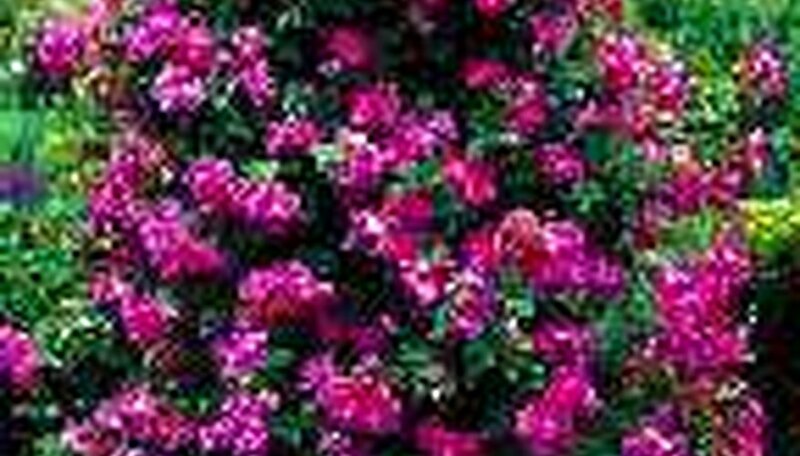 The hedge or screen way of growing them has the merit of ease of access for training and pruning as well as that of giving close enjoyment of the living walls of flowers. A combination of both vertical and horizontal forms is the arch and its cousin, the arbor. The chief difference between the two is the arch is a portal - a structure through which one passes and frequently includes a gate to another portion of the landscape. 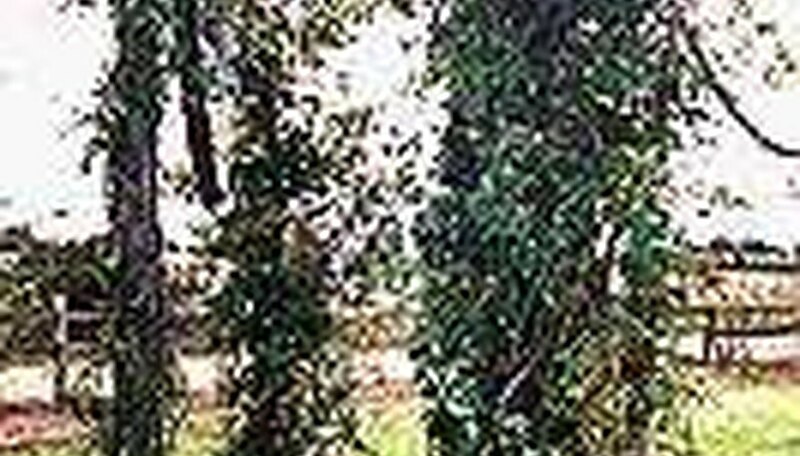 The arbor is a similar structure under which one remains. It frequently contains seating of some design. Generally, these structures are free standing and may or may not have a rounded top, a design originally employed by the Romans centuries ago. A mistake made by many do-it-yourselfers is designing or purchasing an arch too small to be effectively used for the purpose it was intended. A good arch must be not less than 7 - 8 ft (2.5 m) tall. This permits the visitor to easily pass through the arch or stand up under the arbor. A good arbor should be at least 3 ft. (1 m) deep to permit comfortable seating. Pergolas are best described as a series of connected arches which cover a path - a design borrowed from the Italians centuries before. 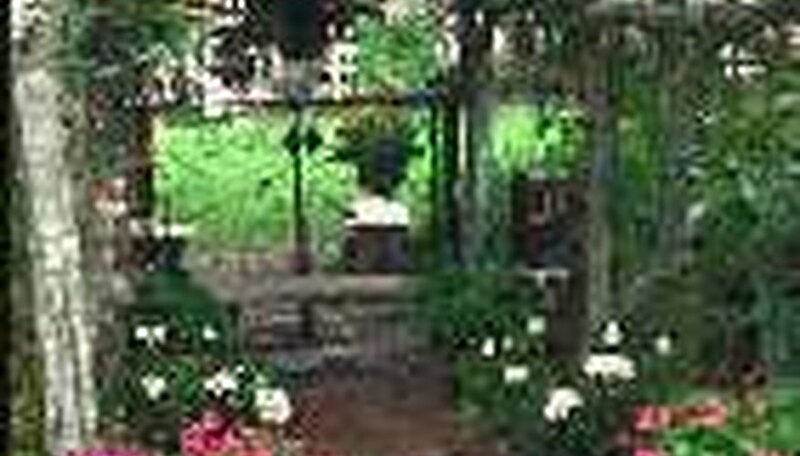 Then, a pergola was a design similar to what the French call an alley or a highly trimmed shrub- or tree-enclosed path. Upright piers of brick, stone, iron or wood are erected in pairs across the path and a connecting beam is put in place. A slighter top is made with thinner pieces such as larch poles, and the whole is planted with free growing climbers. Another adaptation of both vertical and horizontal form is the swag - essentially a series of pillars (the "vertical") connected at the top by a heavy chain or rope (the "horizontal"). The roses are trained up each of the pillars and then along the swag. This form is very effective if used to surround a central area, thus forming a visual screen to enclose the area. Now that we've piqued your imagination, one final thought: When selecting or creating a piece of hardscape to display your rose, decide which is best for your landscape design. Do not use an arch, for example, if the garden visitor will pass through it only to come nose to nose with a wall. Likewise, do not place a rose trellis in the middle of your landscape. Rather, let it screen undesirable scenes from view.